Two weeks from now will find closure coming to something that should have ended a long, long time ago. 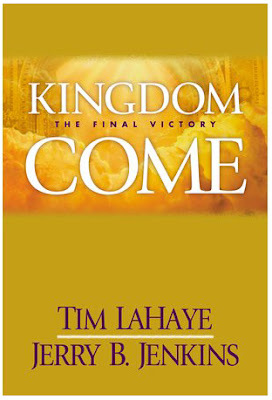 Kingdom Come, purportedly the LAST installment of the Left Behind series of novels, comes out on April 3rd. These books have done absolutely nothing positive for Christianity. They've scared a lot of people into professing Christ as their lord and savior. Unfortunately a relationship with Christ has to be built on something more than fear. Being a Christian isn't supposed to be something you embrace as "fire insurance" against Hell: there's more to it than that. This is something you do because you realize that on your own, you really don't have meaning or purpose. Being a witness for Christ means showing others the work that God is completing in our lives. It doesn't mean scaring people: there's no spiritual growth possible when fear is made out to be the biggest motivation for seeking God. That aside, this series started out fairly good... before it became a joke. It's just too damn long for one thing. As I've noted before (in a now-classic rant against Left Behind), Stephen King only needed seven books for his Dark Tower saga, and when the final book comes out this summer the Harry Potter series will likewise number seven in all. Left Behind is going to be sixteen full-length novels: more than The Dark Tower and Harry Potter combined. Seven books would have been plenty: one for each year of the Tribulation. 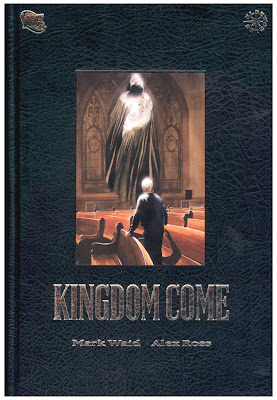 And maybe one wrapping up a thousand years later like Kingdom Come is going to be (but even that might be overkill). For another thing, Left Behind really has become too much of a franchise: something driven more by money than an earnest desire to serve God. I mean, a Left Behind video game...? 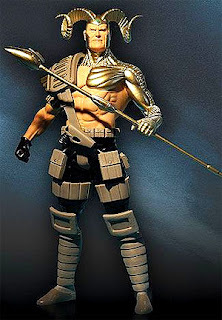 There's also the comic books, a HORRIBLY-produced movie ("It's like The Day of the Jackal as conceived by Ned Flanders..."), I haven't seen them yet but I hear that action figures are floating around out there somewhere. A friend told me just yesterday that Left Behind, while something that's supposed to be apart from this world, has become too much like the world. Dear lord... Left Behind has become a bloated whore. Well, in two weeks it'll finally come to a conclusion. I might get a copy, if nothing else than to post a review here. And also 'cuz I've read the twelve "core" books (but not the prequels) so I guess I do have a morbid curiosity about how this all ends. Both are about the Book of Revelation, so please don't confuse the two! On the left is Nicolae Carpathia from Left Behind: the biblical Antichrist himself. On the right is Magog from DC's Kingdom Come: the man who made Superman run away and hide. Too bad WWF Grunge Match, or whatever that thing was called, isn't still going. Magog would have taken Carpathia in one giant punch. Gonna take more than some pretty-faced stuffed suit to impress the real men and women in this world! But then, with our neuterized society, the delicate hero might be just what the world wants. Supposing, of course, that said 'hero' has the backbone to get so far. Jenna, you're the kind of person who might really dig Kingdom Come (the DC Comics graphic novel that is). It's an *awesome* parable about responsibility and power. It's a story with Superman, Batman, Wonder Woman etc. but the entire story is told from the perspective of an elderly minister who is struggling with his faith. All in all, a VERY good book. And Magog is a complete bad-a**. 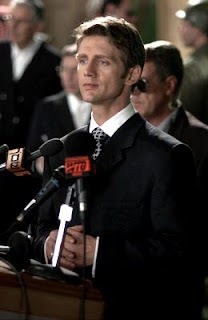 He does two things in particular that are outrageously evil. But you'd be surprised at what happens to him by the end of the story.